There should be some give in the ground after the recent deluge of rain, however trainers will be hoping to have achieved enough fast work in their horses to be competitive here. One such local trainer is Claire Wonnacott who has entered previous Wadebridge and Flete winner Heaney for daughter Millie to ride. Millie is now based working at Neil Mulholland’s yard and recently rode her first winner under rules, Ladies Dancing for Chris Down. Heaney is among the 13 entries in the Heltor-sponsored Conditions race. Honest Deed from the Dean Summersby team, could be among the entries to challenge, having held Heaney to a head second at the Upcott Cross meeting. Portrait King catches the eye, having won over 100k under rules, including a third in the Topham at Aintree. Portrait King now runs for the Woollacott team under the care of long term stable hand Neil McLean, who is now in charge of the Pointers. The opening Maiden race for 4,5 & 6 year-olds is sponsored by The Tiverton Hotel. Robin Why Not stands out for the Joe Tickle team, who have an excellent strike rate with maiden horses. Having run second here last season, he could have the booking of area champion jockey Will Biddick, who is looking to break the all time Point-to-Point wins, the title which is currently held by Richard Burton. Bridge of Cally could be an exiting new recruit for the Dean Summersby yard, having had previous National Hunt form when finishing third in a Hurdle race under rules at Southwell last February, and will have the booking here of Darren Edwards to ride. Seven are entered for the Royal Seven Stars Hotel-sponsored Restricted race, in which Predestined, for local trainer Gordon Chambers could go well. Predestined won his maiden here on heavy going in March and soon followed that run up with a decent second on good to soft at Flete Park, Druid Spitfire has yet to run at this course, but is bred locally by Elizabeth Kessler. He won his maiden at Kilworthy under jockey Tom Chanin, followed by a second at the Vauterhill meeting for the Robert Chanin team. Navanman stands out in the JL Lightfoot Allingeston Stud, Spreyton-sponsored Mixed Open race, which has attracted eleven entries. A previous course winner here last season, along with a win at the Flete park meeting Navanman has been placed in all of his starts in 2018 to date, under jockey Rex Dingle for the John Heard yard. Entry O Maonlai for the local Welch family and Hannah Welch to ride looks a promising horse to follow. He has two seconds in Hunter Chase runs earlier this season at Exeter and Newton Abbot courses, whilst in training with Alexandra Dunn. Sixteen are entered for the Richard Stringer Equine Vet Practice & Mr Richard Mizen-sponsored Open Maiden race. Banco de Logoa is another new recruit for the Dean Summersby team for Darren Edwards to ride, he could be a likely favourite after his second in a hurdle race under rules at Towcester in March, when trained by Seamus Mullins. Outside raider Road to Rome is another to note with National Hunt form when in training with Oliver Sherwood gaining seconds earlier this year in Chase races at Bangor and Ludlow. Road to Rome is now in training with Jospeh O’Shea who is based in Staffordshire. Moonaro is another to note. Based locally at Kingsbridge for the Edward Darke team, Moonaro ran second at Bishops Court and Kilworthy tracks earlier this year, and would be a popular local winner. Nikki Frost wouldn’t have to travel far to this track either, and her debutant maiden Cuddle Up under jockey Josh Newman, could be a worthy each way bet. Exeter Racecourse sponsor the Intermediate race which has attracted six entries. Ballycahane from the Nicky Sheppard (Monmouth) yard will have to defy top weight and a long journey to keep his head in front here. 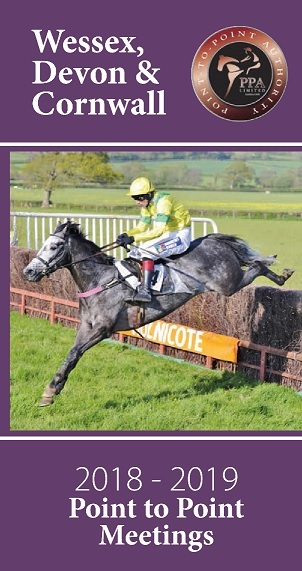 Although has proven to be a good stayer and has some solid form with wins at Chaddesley Corbett and Cockleburrow. Point View Gale for the Woollacott team, won his maiden at Bishops Court twelve months ago and ended last season with a win at Cothelstone in a strong contest having made all that day. The first two past the post qualify for the Connolly’s Red Mills Intermediate series finals to be held at Cheltenham in May.